In comparison to standard energy sources like oil or coal, the demand and supply of renewable energy is difficult to predict, as they are strongly influenced by the natural fluctuations in the power source. This creates problems in determining the amount of renewable energy that would be readily available for different consumer requirements. Wind turbines, such as the ones pictured above create electricity when the wind spins the blades and rotor, which turns a generator. Power is dependent on the amount of wind available at any given moment. Photo Credit: Harry Pears, Flickr. A research group, headed by Prof. Mahesh M. Bandi of the Okinawa Institute of Science and Technology Graduate University (OIST), planned to analyze some of the scientific issues involved in the changes occurring in renewable energy. The group also explored ways to enhance the prediction of energy outputs. The findings were recently published in the New Journal of Physics. A fluctuating power source threatens the even distribution of power in the electrical grid. That makes it difficult to balance the fluctuating power output with the fluctuating consumer demand. Bandi and two of his co-authors, Colm Connaughton and Golan Bel, were post-docs at the Los Alamos National Laboratory, and identified that they had interest to “cook up scientific problems while hiking,” said Bandi. 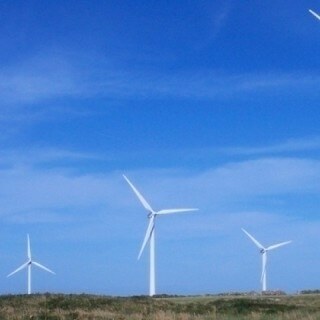 The team decided to continue their analysis on the fluctuations of renewable energy in Okinawa, Japan. The research team, including Märt Toots, a graduate student working with Bandi at OIST during his first year rotation, examined data obtained from the Irish grid wind farms, and discovered that power outputs released from the farms on the grid fluctuate in very similar ways. This varies from the original pre-conceived idea. It’s generally assumed that geographically distributed wind farms are independent. In other words, the fluctuations in power output from one wind farm are different from that of another wind farm, say 50 km away. The data, examined by Bandi and his team highlighted that the wind farms on a grid have stopped functioning independently of one another based on the conditions of the local wind speed, and become part of a bigger geographic weather system that forces all of the wind farms to possess correlated or similar outputs for at least one day. If there is a medium that connects them, then one will observe that the two wind farms will fluctuate in a similar fashion. This does not mean their outputs are exactly synchronized at every instant, but on average their outputs fluctuate very similar to each other. The average is important. That is what we mean by correlated. Forecasting power output can result in errors due to the unpredictability of wind power supply, and the larger geographic weather system. Bandi’s team came up with two types of errors, which include scaling and time-scale. These errors were detected in forecasting via statistical analysis in order to identify trends and examine fluctuations occurring around those trends present in the wind power grid data. The researchers carried out a statistical analysis that could play a vital role in predicting the demand and supply requirements in wind power, and this method could be used in many other renewable energy research projects. This technique or tool is not limited to wind power. This means it can also be utilized across other sources of renewable energy to predict error, as long as they have time-related corresponding changes with a statistical structure.